"A solitaire variant allowing you to choose the foundation to move the card to"
The freeware download offered here is called Bisley Solitaire. The solitaire fans among you might rejoice as here’s another variant of this famous card game. Elsewhere on Winportal you can find a significant amount of solitaire variants, but Bisley Solitaire is a special one because it will allow you to choose to which foundation a card has to be moved to. There’re not many one-deck solitaire games that will let you do so. 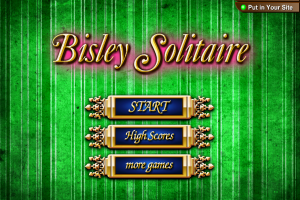 Now, without entering into the details about Bisley Solitaire’s gameplay, which die-hard solitaire gamers might want to find out themselves, considering it part of the enjoyment of learning to master a new variant of their favourite game, we can say it features an attractive graphical environment you can see on the provided preview images. So, if interested in playing this free solitaire variant, hit the download button now.